Native American rattles have been and are used for many purposes including healing and other medicine uses, dancing for ceremony and celebration, commemorating birth and more. To First Nations people, shakers or rattles represent rain (for prayers of abundance and prosperity) and tears, especially those of emotional release. Tears of joy signifying when the mind, body, soul and spirit connect. Ceremonially, rattles are used in cleansing and purifying, spiritual guidance work, celebration and in thanks and respect to Ancestral Spirits. The rattling items are either inside or outside. Rattles such as gourds might have small items inside such as beans, corn, small stones, or even the seeds native to the gourd itself. Rattles with external sound makers are adorned with pieces of metal, tinkle cones, bells, beads and more. The Medicine Wheel, or Circle of Life, is found in many tribes and in many parts of the world, but there are beliefs common to them all. The compass points North, South, East and West give four directions. Mother Earth is below and Father Sky is above, giving six directions. These six directions are also symbolized by animal fetish carvings. The circle shape represents life. We change like the seasons as we pass through life, traveling through the path of the circle. The center of the circle is the Spirit, from which everything extends and everything returns. 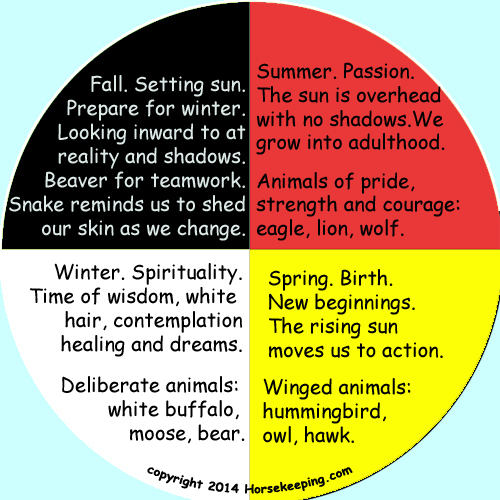 Below are some general beliefs about the colors, animal totems and uses of the medicine wheel. Various tribes have different versions of the medicine wheel as to which color should be located where and what it represents. Every tribe and every person has their own beliefs and you should use what best fits what you believe.